Buongiorno! Vuoi imparare l’italiano? Do you want to learn Italian? For centuries, Tuscany has attracted people from all over the world to marvel at its art, culture and stunning landscapes. Tuscany’s charming towns, sweeping countryside and gastronomic delights have made it a firm favourite with our guests. And, as the birthplace of Italian, what could be a more inspiring place to learn the local language? Enjoy trips to explore nearby towns, like Arezzo or San Gimignano with its unique medieval towers, where you can soak up the atmosphere with some sight-seeing or shopping at the local markets. What’s more, with meals in authentic trattorias and the chance to enjoy a private wine tasting in a local winery – there are endless opportunities to try out the Italian you have learnt! 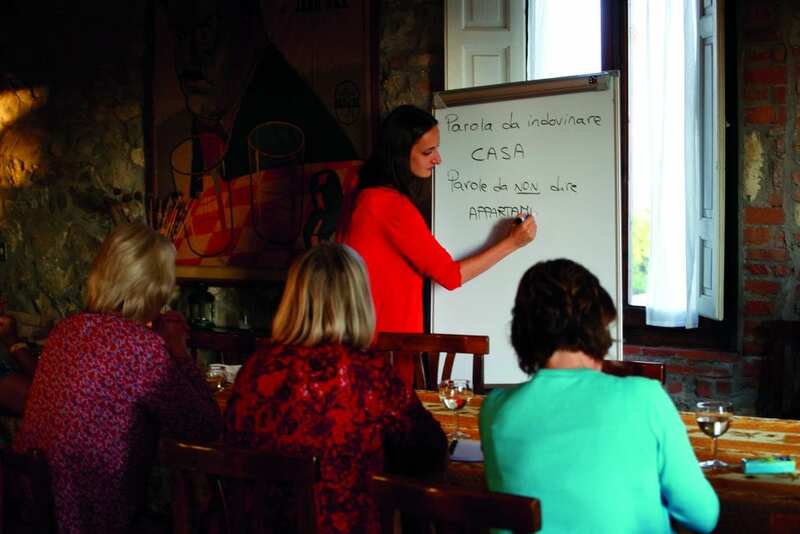 Guests will benefit from daily Italian lessons with our experienced, native Italian teachers in small groups, perfect for any level of skill. Enjoy trips to explore near-by towns, where you can soak up the atmosphere with some sight-seeing or shopping at the local markets. What’s more, with meals in authentic trattorie, there are endless opportunities to try out the Italian you have learnt. The evening Aperitivo Chat sessions are also a great, relaxed way to practise your Italian with fellow guests over a good glass of wine or two! Benvenuti! You’ll be meet at Pisa Airport and take a group transfer to the villa for welcome drinks on the terrace. Dinner this evening is at the villa, prepared by your chef. After breakfast you will have your first Italian lesson, followed by lunch at the villa. In the afternoon you will have your second Italian lesson followed by an Aperitivo Chat session before dinner, prepared by your chef. After breakfast, enjoy a lesson with your Italian tutor at the villa before lunch. In the afternoon, you will visit a local winery for a private wine tasting and return to the villa for dinner. After breakfast, enjoy a day exploring a local city, e.g. Volterra or Siena. Spend the day sight-seeing or shopping at leisure. Lunch will be at a local trattoria. Return to the villa late afternoon for your Aperitivo Chat session and dinner. After breakfast, you will have your first Italian lesson of the day. Lunch will be prepared for you at the villa. This afternoon, you will have your second lesson of the day followed by some time to relax or maybe go for a walk in the area surrounding the villa. Dinner will be later in the evening. After breakfast this morning, another lesson with your tutor, followed by lunch. The afternoon will be spent in a local town, e.g. San Gimignano or Arezzo. You’ll have a chance to try out your language skills on the locals, to explore and to do some shopping before dinner at a local restaurant. After breakfast, you will have your Italian lesson, followed by lunch. This afternoon you will have some time to relax at the villa before your final Italian lesson. Enjoy a final Aperitivo Chat session, followed by a special farewell dinner, prepared by your chef. After breakfast you will have some time to pack before your transfer will take you back to Pisa Airport for your fight home. Arrivederci!